Daniel means ‘My judge is God’. The Book of Daniel is written during a time of great persecution when Antiochus Epiphanes is forcing Jews to convert to pagan gods. Here is the first time in Hebrew scriptures that a resurrection of the faithful is mentioned. God is the master of history. All those ‘in the book’ who ‘shine brightly’ and lead people on the way to ‘justice’ will be like stars living forever. Examine your own life. How would the statement ‘my judge is God’ shape your life? Antiochus may not be forcing you to eat pigs flesh (abhorent and unclean to Jews) but what idols or practices are you subtly invited to ‘eat’? The Book of Daniel and The Book of Revelation are apocalyptic writings ‘unveiling’ a vision of what will take place at the end of time. Each Gospel inserts some apocalyptic passages pointing toward that final day. The images of the sun darkened, stars falling, heavenly struggle, share a cosmic event affecting all of creation. Have you noticed that at the crucifixion of Jesus these images appear. Could this mean that the final ‘event’ and ‘struggle’ and ‘victory’ has taken place on the cross? Could this be why the early disciples were so expectant of Jesus’ return before ‘this generation passed away’? Why the delay in the second coming is a question asked by Christians. Why is Jesus sitting ‘waiting’ in heaven as portrayed in Hebrews? 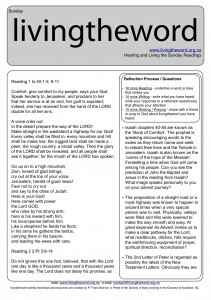 The Gospel points to a ‘gathering of the elect from the four corners of the earth’. Will this require all the earth to ‘hear the message of Jesus’? Is Jesus lazy on a heavenly chair or waiting urgently to work in the Church, in the sacraments, in each disciple, winning the world ‘heart by heart’? How do you understand christian ‘waiting’ for the second coming? ‘That day or hour’ is unknown. That it will happen is certain, when it will happen is uncertain. Consider a spiritual practice of imagination prayer. Present yourself to Jesus at the end of time. What does he say? What do you say?